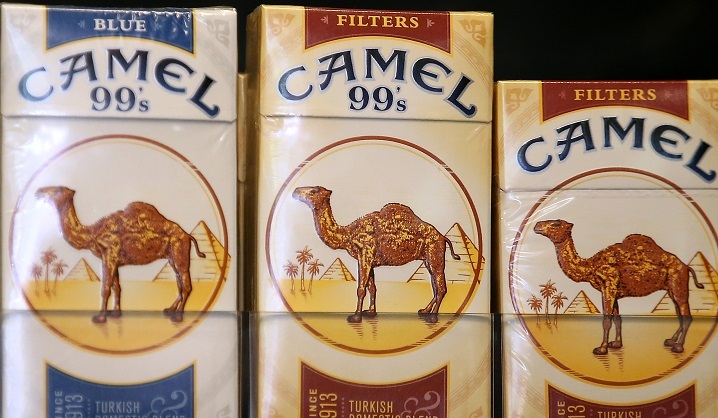 Packs of Camel cigarettes, manufactured by Reynolds Amercian Inc., are displayed at a tobacco shop in 2014 in San Francisco. The country’s second-biggest tobacco company has been a top funder of the controversial “dark money” organization created to promote President Donald Trump’s legislative agenda, according to a MapLight review. Reynolds American Inc., which manufactures Newport and Camel cigarettes, disclosed last week that it donated $1.5 million to America First Policies in 2017. Created by former Trump campaign officials, the nonprofit has faced criticism for the racist, anti-Muslim and anti-Semitic views expressed by its staff. While America First Policies raised $26 million last year, three Fortune 500 companies said earlier this month that they would no longer give money to the organization after MapLight reported on their donations. Two officials have left the group in recent weeks. The donation from Reynolds is the largest known contribution to America First Policies, which does not disclose its donors to the public. Reynolds also gave $1 million to Trump’s inaugural committee. Cigarette smoking kills more than 480,000 Americans each year, according to the Centers for Disease Control and Prevention. "Dark money groups are often used to disguise the support for candidates or officeholders from unsavory industries," said Brendan Fischer, a lawyer at the nonprofit Campaign Legal Center in Washington, D.C. "Trump may not want to be publicly associated with the tobacco industry, but the tobacco industry certainly wants Trump's support for their agenda." Reynolds American and America First Policies did not respond to questions from MapLight. Reynolds has been a major beneficiary of Trump’s time in Washington. The Republican tax bill was a boon for the company, which reported lobbying on the legislation. Reynolds announced that most of its employees would receive a $1,000 bonus. Its parent company, London-based British American Tobacco, said it will ultimately save $13.3 billion under the new law. Last year, the Trump administration allowed British American Tobacco’s $54 billion acquisition of Reynolds to proceed without raising any antitrust questions. The purchase created the world’s largest publicly traded tobacco company, and it means that Reynolds is now a wholly owned subsidiary of a British company. Although federal election law bars foreign nationals from participating in U.S. elections, domestic subsidiaries of foreign corporations are allowed to spend in elections. The only conditions are that the money must come from U.S. profits, and the spending can’t be directed by foreign nationals. In 2016, the Intercept reported that a Chinese-owned company had donated $1.3 million to a super PAC supporting former Florida Gov. Jeb Bush’s failed presidential campaign at the direction of a foreign national. America First Policies and its sister super PAC, America First Action, set a fundraising goal of $100 million to support Trump’s agenda and aid Republican congressional candidates in the midterm elections this year. Last year, America First Policies disclosed spending $452,000 to support former Sen. Luther Strange, R-Ala., in his unsuccessful GOP primary campaign, and it spent more than $1.3 million to prevent Democrat Jon Ossoff from winning an open congressional seat in Georgia. The organization has hosted more than a dozen events with Vice President Mike Pence this year to build support for the Republican tax law. Pence was heckled by protestors at a recent America First Policies event in Ohio over his anti-gay views and the administration’s immigration policy, which has separated thousands of immigrant children from their families at the border.